Left fuming, impassioned or just plain-inspired by a story of eco-injustice? Eager to do something about it? Something a little more substantial than firing off a comment into the tweet-o-sphere - or a throwing a few dollars at the charity of choice? Then may be it is time to join the army! The army of of eco-citizen scientists, that is - volunteers who are increasingly making a real difference at the front-line of ecological research. Earthwatch - the research charity that broke ground on the idea of getting the publics hands dirty, in the service of ecology - has just finished hosting a session promoting the value of 'citizen science', to a gathering of ecologists in Spain. Dr Dan Bebber, head of Climate Change Research at the Earthwatch Institute - and the man who convened the session 'Involving Citizen Scientists in Ecology' - has put out an open invite to the public to get involved. "No scientific qualifications are necessary, just an interest in environmental issues and a desire to help! The research projects that Earthwatch supports are all suitable for volunteer participation - the data collection is easy to teach, and to undertake," he said, just before leaving for the 12th conference of the European Ecological Federation. The Earthwatch Institute started its program, of bringing the masses to science, back in 1971. Since then more than 90,000 people have volunteered their time to help scientists get a better handle on the environmental challenges facing the planet. The research projects are as diverse as checking-up on how the Gulf of Mexico oil spill has affected sea-birds, to monitoring leatherback sea turtles in Costa Rica, to chronicling the endangered wildlife of the Amazon from a steamboat. This is very different approach to that taken by other environmental charities and groups, which often focus on broader education, or mass-participation through natural sightings and simple measurements. "There are many environmental research institutes; environmental education organizations; and environmental volunteering groups. 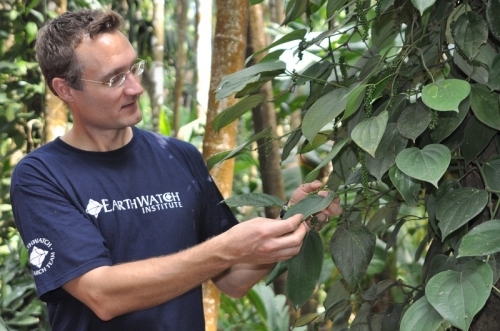 But Earthwatch is a hybrid of all three - a powerful model that allows Earthwatch to fund long-term scientific field research projects," said Dr Bebber. That hybrid nature means that there is a two-way flow of inspiration and understanding between the public, as volunteers, and the scientists, working in the field. "The Earthwatch model of Citizen Science is different, in that the public get to work with scientists directly, and to learn from them, rather than collecting data remotely". The scientists themselves get much from the experience - as well as seeing their projects completed faster, or being able broaden their scope. And it appears that wider ripples of change are being cast by those who volunteer. After being immersed in real-world ecological issues, during their research efforts, they often become torch-bearers for the environment in their local communities. So claimed Dr Bebber; "Feedback from public volunteers has shown that being in the field often has a transformative effect on the volunteers, who return home inspired to lead change in their communities. To date 1,500 returning volunteers have set up a local action project in their own community." One of the major recent projects that Earthwatch have been involved in is the Climate Champions program - a partnership with the bank HSBC. It has seen over 2,000 bank employees trading in their office desks for wellies-and-clipboards. They have helped out with research into areas such as the impact of logging, and effects of climate change, at five Earthwatch Regional Climate Centers. "When people meet and exchange ideas and viewpoints, great things can happen. For example, at the Regional Climate Center in Brazil, HSBC volunteers have been working with local beekeepers to monitor honey production by native bees. The volunteers gain an understanding of the local economy, while the beekeepers have learned Spanish and have gained a new market for their products," extolled Dr Bebber. And again, these volunteers appear to have taken the message of environmental awareness back home, as well as back to the office. "75% of the Climate Champions agreed that they have, or are doing, climate change related projects at work and 96% are taking action in response to climate change at home," said Dr Bebber, quoting an Ashridge Business School evaluation of the program. Of course, having these additional volunteers could be seen as something of an extra environmental burden in itself - and possibly complicating relations between the research team and the communities that host them. But Dr Bebber believes that the approach taken at Earthwatch gets round possible conflicts here. Firstly, the charity works with verified carbon-offsetters to reduce the impact of its carbon emissions, including those incurred by volunteers. And Earthwatch also avoids rushing into research projects without local buy-in. "We have to be very careful not to cause any problems to local communities, and this is why we always work with scientists who have a long term relationship with the field site." So if you're moved to go beyond a tentative toe-dipping into green waters, and want make your own splash, then hands-on citizen science projects like these could be for you. No previous qualifications are needed - just a bundle of passion and commitment. And age is no barrier either, according to Dr Bebber. "Earthwatch volunteers are drawn from every walk of life: students, educators, families, conservation professionals and corporations. Several volunteers have participated on more than 50 projects. Volunteers range from 10 years old on the family teams to the over 60s - our minimum age is 16 for adult, teen teams and school groups - but there is no upper age limit!" No excuses then, to delaying a move to make your own contribution to the battle for saving of the planet.